Leading nutritional experts including the British Nutrition Foundation recommend drinking at least 8 glasses (approx. 2 litres) of water every day. Drinking more water isn't just better for the individual, it's better for your business too, as being fully hydrated improves alertness, brain functions and energy levels. Keeping your employees healthy and hydrated improves productivity and reduces sickness levels. Although government guidelines say that we should all drink eight glasses of water a day, your size, the temperature and how active you are can all make a difference (so if you're exercising a lot on a hot day, you'll need to drink more). Do tea, coffee and fizzy drinks count? Nutritionists and dieticians advise that high quality water, free from flavourings and additives is more beneficial than tea, coffee, fruit squashes or carbonated drinks, although these also help to keep us hydrated. If you're feeling thirsty you're already dehydrated so don't wait until you need a drink, sip small amounts throughout the day to keep yourself hydrated. 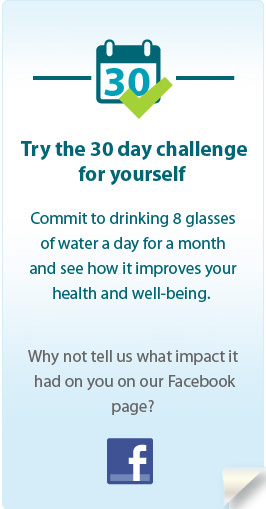 Why not try our 30 day challenge and see.